#750: Stand on Top of Torrey Pines. - The.Vintage.Explorer. #750: Stand on Top of Torrey Pines. Do you know where one of the best spots is to watch a San Diego sunset? It’s a tough call (there are so many in this city), but I do. It’s atop Broken Hill at Torrey Pines State Reserve. 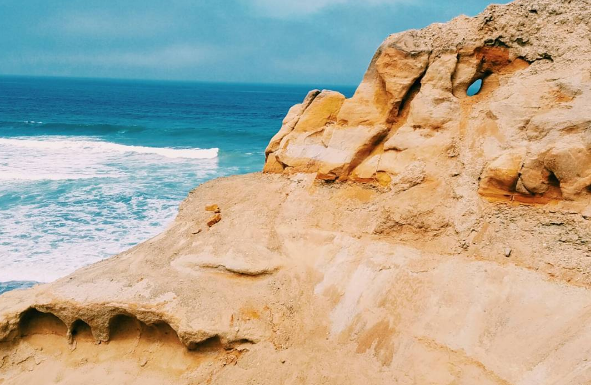 Torrey Pines has three great things (plus more, I’m sure): the rarest pine tree in the nation, amazing sculpted sand cliffs, and literally a “key-hole” in the sandstone rock. Interestingly enough, these sedimentary rocks used to be the ocean seafloor millions of years ago. Now they’re high on a hill overlooking the same ocean. Previous Post: #748: Surf The Original Dog Beach.